In the late 2000s, Judd Apatow was churning out what seemed to be a new movie every week, whether it be as a director or mostly a producer. A decade later, and he's slowed his roll quite a bit. He hasn't helmed a movie since 2015's Trainwreck, which served as a centerpiece for Amy Schumer, offering a semi-autobiographical look at the comedian's life. Now, he's locked in his next project, and it's quite similiar. Only this time he'll be putting SNL Not Ready for Prime Time Player Pete Davidson under the microscope. 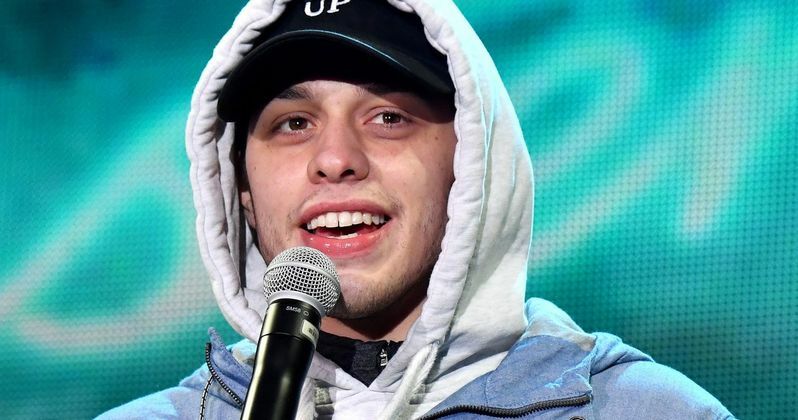 There is a lot going on with Pete Davidson, who most recently tweeted out a suicide scare that concerned quite a few fans and cohorts in the comedy world. He also recently broke up with pop star Ariana Grande after a much publicized engagement. The new comedy will put a skewed mask on these woes, though Pete won't necessarily be playing himself. The Judd Apatow Pete Davidson Comedy will include the story of his real-life father, a first responder firefighter who passed during the 9/11 terrorist attacks in New York. The new movie is being directly compared to Amy Schumer's Trainwreck and also falls in line with Apatow's 2009 effort Funny People, starring Adam Sandler as an older comedian struggling to come to terms with his modern day place in the world after he's diagnosed with a deadly disease. Aside from the recent suicide scare, Pete Davidson also attracted much attention over a joke he made about former SEAL turned Republican congressman Dan Crenshaw, who lost his eye in battle and now wears an eyepatch. The comedian joined Crenshaw in a later SNL episode to apologize on air. Though 2018 proved to be a rocky year for Davidson, he is now getting more screen time on Saturday Night Live, and more people certainly know who he is. He continues to do his special segments on Weekend Update but has also been popping up in more sketches, something he's said he doesn't particularly enjoy. Pete Davidson collaborated on the screenplay with Judd Apatow and Dave Sirus. Davidson has been upping his big screen game over the recent year, appearing in the movie Big Time Adolescence, which just premiered at Sundance. He is also featured in the upcoming comedy remake of What Women Want, now titled What Men Want, appearing opposite Taraji P. Henson. Pete Davidson made his big screen debut in the 2014 comedy School Dance playing a character named Stinkfinger. He also appeared in Judd Apatow's Trainwreck, so the pair already have a good working relationship. Last Year, Pete had a supporting role in the Netflix Original Movie Set It Up. Pete Davidson is currently back at SNL, and will appear in a new episode this weekend. He will appear in The Big Lewbowski spin-off Going Places, which finds John Tuturro reprising his role as pederast bowler Jesus. Also coming in 2019 is the Netflix Mötley Crüe biopic Dirt, where Davidson will appear alongside real-life friend Machine Gun Kelly playing real-life artist manager Tom Zutaut.